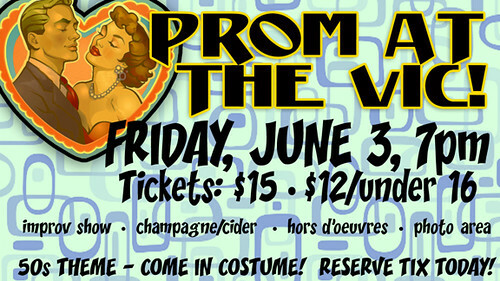 Home » Events » Prom at the VIC! 2nd Annual Prom at the VIC! Our 2nd annual prom is here – it’s a 50s theme! Singles, couples, families welcome! Costumes are encouraged — a King and Queen of the Prom will be chosen! photo area for your prom pics! Whether you were high school royalty or the under-the-bleachers outcasts, the VIC welcomes one and all to our crepe paper-and-balloon extravaganza. Improv scenes, games and musical numbers will explore the agony and ecstasy, the highs and the lows, as school lets out — forever!